Low Vision From Macular Degeneration? Our Eye Doctors Can Help! The macula is the most sensitive part of the retina, the film in the back of the eye which turns light into vision. It is located in the center and is responsible for clear, high-definition, central vision. Macular Degeneration (AMD) is an eye condition that occurs due to damage to the macula, thus, causing partial or complete loss of central vision. Macular Degeneration is the predominant cause of vision loss affecting over 10 million American adults age 60+. During its early stages, patients will experience decreased central vision, which will only continue to worsen over time. For now, there is no cure for AMD. Nonetheless, the condition can still be managed. 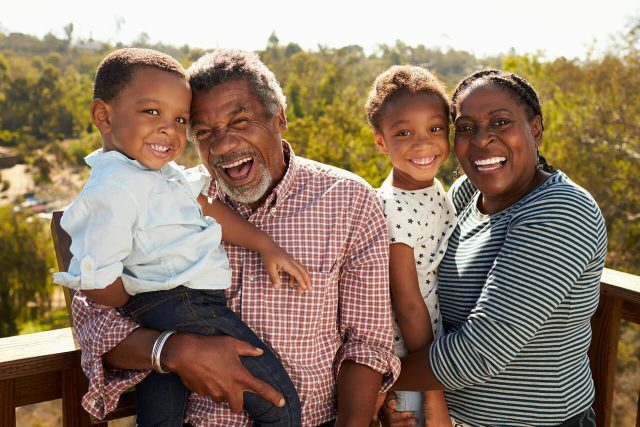 At Low Vision Doctors of Ohio, we know how vital your vision is to live a comfortable, convenient, and enjoyable life. We offer macular degeneration patients with suitable, high-quality, low vision glasses that will help improve their vision. Our treatment procedures will help manage the condition, reduce the risk, and, in most cases, slow down the progression. Whether you are experiencing difficulty reading, driving, seeing faces, or any other vision difficulty, our low vision doctor, Dr. Mark Rinkov, will use every possible means to recommend the ideal low vision glasses for you. 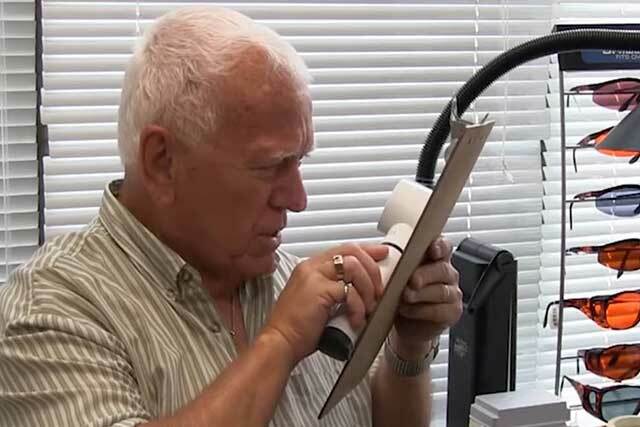 We serve patients all over Worthington, Ohio at our low vision clinic. 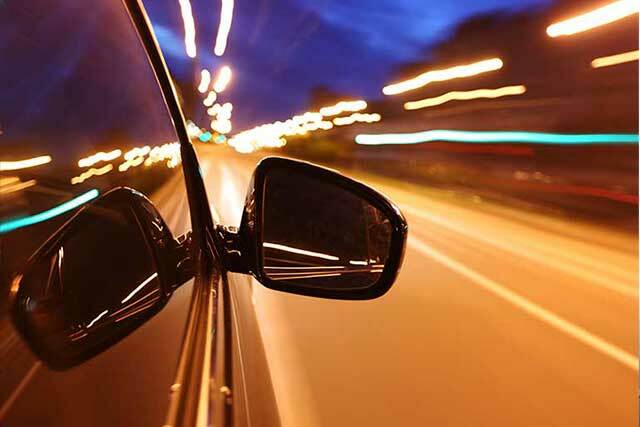 How Can I Drive With Macular Degeneration? Central vision is very important for driving. Unfortunately, since macular degeneration causes central vision loss, driving becomes difficult or impossible with a central blind spot. Nonetheless, there are low vision glasses that can help enhance your vision. This involves mounting a miniature binocular called a bioptic telescope, on your eyeglasses. This will help you drive as you will be able to recognize the color of traffic lights and see street signs. Although, it is important to undergo a specialized training program before you are allowed to drive in Ohio. How Can I Read With Macular Degeneration? Macular Degeneration causes a central blind spot which makes it tough to read small print. What’s more, your eyes will continue to struggle as you focus on new words. Hence, reading will be very slow. To enhance your reading abilities, our low vision doctor, Dr. Mark Rinkov, will recommend the right low vision glasses for you. This can include low vision magnifying reading glasses or prismatic eyeglasses. These low vision glasses will provide high-powered magnification that will lessen the effect of the central blind spot. 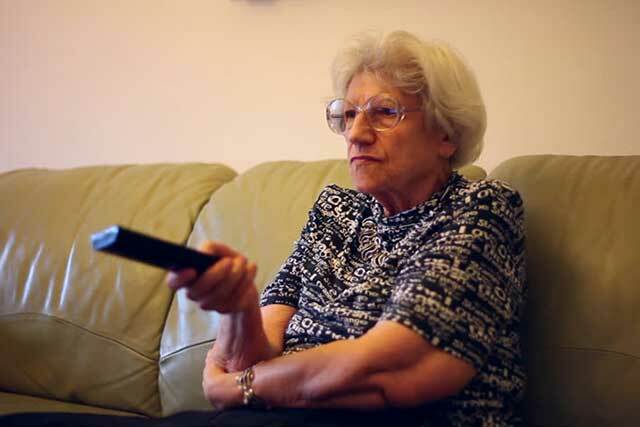 How Can I Watch TV With Macular Degeneration? Sitting closer to the TV to enlarge and spread the image across a peripheral retina. Purchasing a TV that has a very large screen and sharper quality for clearer images. The use of a telescopic system or other low vision aids to provide magnification when viewing the television. They also feature special tints and coatings to help reduce glare, improve light transmission, and improve contrast. At Low Vision Doctors of Ohio, we have the ideal low vision glasses for you at our Worthington low vision center. How Can I See My Phone Better If I Have Macular Degeneration? Like other activities which require light, patients with macular degeneration may find it difficult to operate their phone. You may have to move your mobile devices very close to your eyes. You can also magnify your fonts to operate the phone. 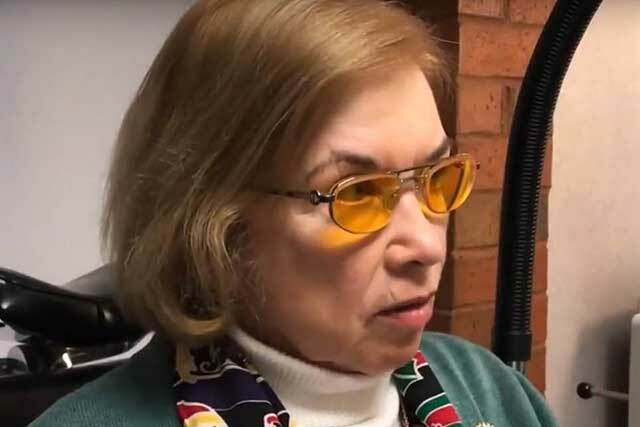 When you visit our low vision center, we will recommend low vision glasses that will help enhance your vision while improving light transmission and reducing glare. How Can I Better Make Out Faces If I Have Macular Degeneration? Another serious challenge you can face as an AMD patient is making out faces. Due to the central blind spot, every image, object, or face directly in front of you will appear blurry. Although, you will be able to recognize those you are familiar with using their voice, shape or walking posture, you will need special low vision glasses to make out new faces. What Low Vision Glasses Can I Use For Macular Degeneration? Bioptic telescopic glasses or bioptic lens system is a combination of a telescope and two optical lenses. The telescopes are attached to the lenses of the eyeglasses. Bioptic telescopes can enhance the vision of macular degeneration patients. With this low vision aid, patients can see better at any distance. The low vision glasses are also used for watching television, identifying faces, signs, blackboards, and lots more. Low vision magnifying reading glasses are also recommended for macular degeneration patient to help enhance their vision for reading print. The glasses will magnify the fonts and make it easier for the patient to read. Prismatic Eyeglasses are excellent examples of low vision magnifying reading glasses. Prismatic eyeglasses are extra strong reading glasses. They provide space for a natural, comfortable focal point. Prismatic eyeglasses feature optical quality spherical lenses which magnify and converge the image concurrently. They are useful for reading aids. E-Scoop glasses are custom designed optics which combine five unique optical characteristics to improve the vision of the patient suffering from macular degeneration. These five optical features increase image size, improve contrast, allow more light into the eye, while allowing the user to wear them constantly. Special prescription binoculars or telescopes that are mounted on the glasses are useful for various activities such as watching the grandchildren play sports, enjoying the theater, watching television, taking in a baseball or football game, recognizing faces, appreciating the scenery, exploring a museum, reading a McDonalds menu and lots more. Our low vision doctor, Dr. Mark Rinkov, can also recommend customized, prescription optical systems for macular degeneration patients. These optical systems feature microscopic, telescopic, prismatic, and filter lenses to maximize images and objects. 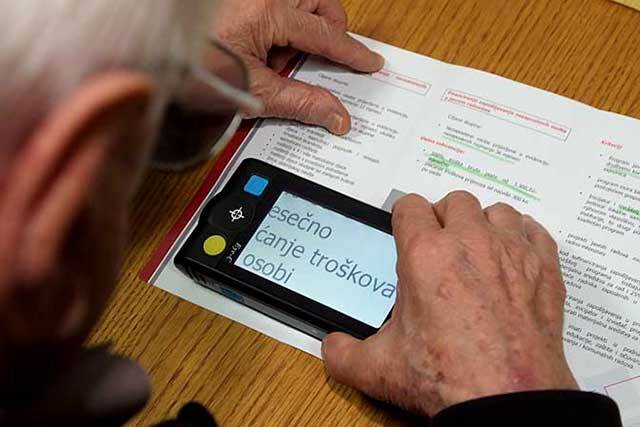 CCTV magnifier is a combination of a camera and TV screen used to provide low vision aid for macular degeneration patients. The camera is pointed at an object while a magnified image will appear on the screen. The patient will be able to see the magnified image that appears on the screen and use it to work in real time. There are also hand-held and desktop video magnifiers. These low-vision magnifiers come in a variety of strengths, light, color contrast, and magnification capabilities. While some are handheld, others can be connected to the computer. OrCam is another device that is changing how people with macular degeneration and other low vision issues can perceive the world. The OrCam features a camera, speaker and a cable connected to a larger device. This tiny device is attached to the patient’s eyeglasses. OrCam uses AI technology to help people with visual impairment read texts, recognize faces, identify products, and so forth. 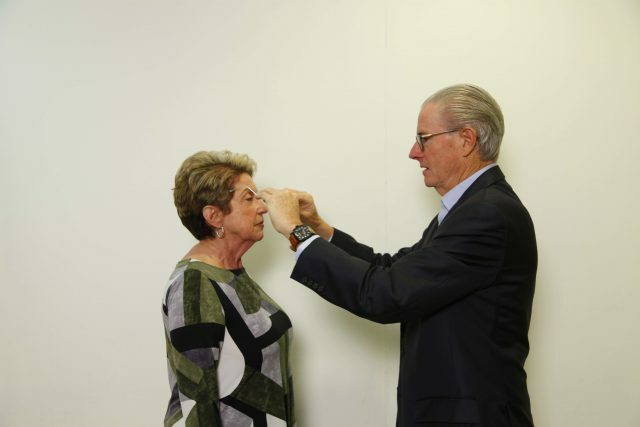 OrCam will give you the secret power over your macular degeneration issues. IrisVision is a wearable device that comes with the advanced virtual reality technology. With this, patients with macular degeneration can carry out their daily activities easily. IrisVision offer about 70-degree field of view. With this, patients can see the world clearly and fully. One disadvantage of iris vision is the inability to walk around while wearing the device. Above all, this low vision device features multiple view modes depending on the activity you intend to do. Whether you intend to watch television, read texts, or have a general view, you can switch between TV Mode, reading modes, or scene modes respectively. IrisVision provides a cost-effective and efficient way for you to live a quality life when you have macular degeneration. Our low vision doctor, Dr. Mark Rinkov, will examine the situation of your eye and the severity of the condition. With this, we can recommend the ideal low vision aids or glasses for you. What Advanced Technology Is Available For Macular Degeneration? Advances in technology have made it possible for patients with low vision conditions such as macular degeneration to live and work just like individuals with normal vision. This has led to the development of telescopic implants known as Implantable Miniature Telescope (IMT). These IMTs will help to enhance visual acuity by reducing the effect of the central "blind spot" caused by macular degeneration. In the future the condition may be managed by using advanced stem-cell treatment procedures. How Do I Cope With Or Manage Macular Degeneration? When indoors, sit far from the window and shut the curtains. Put on sun filters to reduce glare and light sensitivity. Read print materials that have fonts of large sizes. Avoid places with second-hand cigarette smoke. To help patients with AMD, it is essential to understand the cause of this disease. Macular degeneration is caused by factors such as age, genetic factors, biological process, and the environment. With time, various white and yellow color spots surround the central area of the retina. AMD also affects the retinal pigment epithelium (RPE). This will also destroy the photoreceptor cells that send information to the brain to help you see properly. Basically, there are two types of AMD – Dry and Wet. About 85% to 90% of AMD cases are the dry, or atrophic type. The wet, or exudative, type make up the rest. During the early stage, the patient may not experience vision loss. However, if you go for a regular eye exam, the condition can be identified early enough. The early stage of macular degeneration is diagnosed with the presence of small yellow deposits beneath the retina. 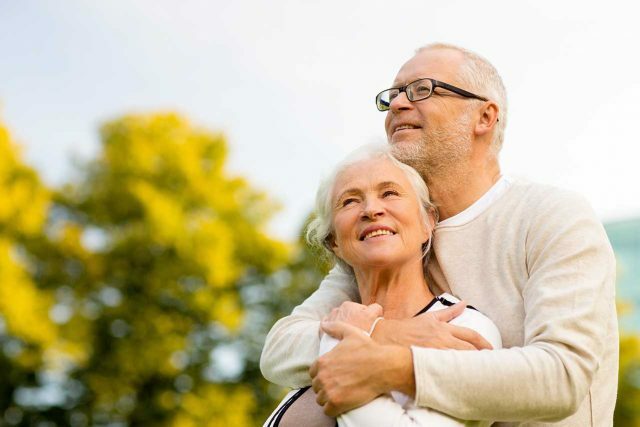 As AMD progresses, the patient will start to experience central vision loss. What Are The Symptoms Of Macular Degeneration? Central vision is affected due to a central blind spot. Vision continues to deteriorate over time, although side vision will remain intact. Difficulty making out faces and other activities such as watching TV, sports, reading, driving. Vision difficulties in low light conditions. Loss of color vision during the later stages. What Are The Causes Of Macular Degeneration? Race – AMD is prevalent among Caucasians compared to Hispanics, Latinos, or African Americans. What Are Some Treatments For Macular Degeneration? For now, no known cure exists for macular degeneration. However, there are certain lifestyle changes that can help manage the condition and slow down the progression. These lifestyle changes include dieting, avoiding smoking, and regular exercises. Patients should also protect their eyes from direct sunlight exposure or UV rays. At Low Vision Doctors of Ohio, we offer AMD patients several low vision aids and glasses that can help manage or improve their vision. We provide patients with personalized vision aids including bioptic telescopic glasses, low vision magnifying reading glasses, and other customized, prescription binoculars or telescopes. With these aids patients can live a quality life and carry out other activities just like people with normal vision. What’s more, we understand that the severity of macular degeneration usually varies between patients. Our low vision doctor, Dr. Mark Rinkov, will recommend custom-made eyeglasses for you. It is legal to drive with these glasses in most states. If properly used, you can also enjoy a normal and independent life with our low vision glasses. If you have been diagnosed with macular degeneration, there is still hope for you. Contact us today at Low Vision Doctors of Ohio. Our low vision doctor, Dr. Mark Rinkov will be available to speak with you and discuss your options. We will carry out a comprehensive eye exam to determine your eye condition. If you are diagnosed with AMD, we will provide you with personalized low vision glasses. Is Centrasight right for you? A new technology, the first implantable medical device for those suffering end stage macular degeneration. Learn more at the IALVS National Website! Been Told Nothing Can Be Done?